In 2004, scientists Andre Geim and Kostya Novoselov from the University of Manchester, used adhesive tape to lift a thin layer of carbon from a block of graphite, and placed it on a silicone wafer. Graphite is the stuff commonly found in pencil lead. As simple as this sounds, what these two scientists had created was a 2-dimensional form of carbon known as graphene, and in 2010 they received the Nobel Prize in Physics for this discovery. But that’s only part of the story. What makes the discovery of graphene so important is all of its unusual properties. It is a pure form of carbon that is very thin, very strong and very expensive. SUPER THIN – It is only one atom thick, so it is almost transparent. SUPER STRONG – Graphene is the strongest material ever discovered, 100 times stronger than diamond, and 200 times stronger than steel, and yet flexible and even stretchable. SUPER CONDUCTOR – It conducts heat and electricity faster at room temperature than any other known material. It also charges and discharges electrically up to 1000x faster than traditional batteries. SUPER EXPENSIVE – Even using the most advanced processes for manufacturing it, graphene still runs around about $100,000 per square meter. 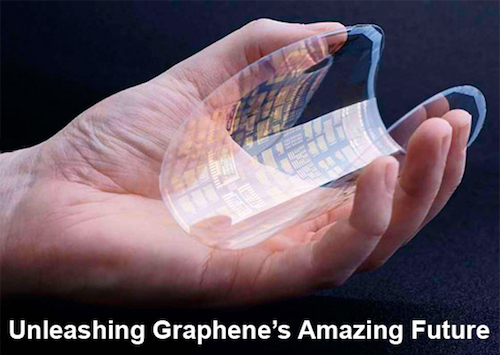 These unusual attributes have made graphene the most exciting new material in all of science. Since its discovery, a total of 8,413 patents were granted by February 2013 in areas such as super computing, electronics, energy storage, telecommunications, renewable power, health care, and telecommunications. Over the coming years, the price of graphene will go through an exponential price drop similar to Moore’s Law. Here’s why graphene and a host of other super materials are turning material science into the hottest of all hot new fields of research. Nobel laureate Andre Geim was once asked why he never patented graphene. His answer was that a tech company executive told him that in a few years, big companies would hold so many graphene patents that he’d spend a fortune suing them. Little did he know that a patent was filed on graphene a full 2 years before his so-called breakthrough discovery. US patent number 7071258, titled “Nano-scaled graphene plates” was filed in October 2002 by Dr. Bor Jang, founder of Angstron Materials, and Dr. Wen Huang, researcher at Nanotek Instruments, a company that was also founded by Dr. Jang. Both are in Akron, Ohio. Dr. Bor Jang is an extremely rare scientific talent who had done tons of work on graphene long before the rest of academia discovered it. He currently holds over 40 patents on graphene-related applications and that number continues to grow. One shortcoming though, Dr. Jang almost never publishes scientific papers, making him virtually unknown in academia. So did the Nobel Committee award the prize to the wrong people? In a word – yes. This was a serious oversight by the Nobel Foundation for not searching patent activity first. The Wikipedia entry for “graphene” is over three times longer than the entry for “steel.” It also has over three times as many references. Even though graphene is made from carbon, its unusual properties and distinctive attributes have required a mountain of research, and this, in turn, requires a mountain of explanation. It’s these distinctive attributes that make it valuable in so many different industries. 2. Energy Storage – Dr. Bor Jang’s super capacitor patents may also hold the keys to our coming energy storage revolution. Researchers at Korea’s Gwangju Institute of Science and Technology have already demonstrated graphene-based super capacitors that can charge 100% in just 16 seconds and repeat the charge-discharge cycle over 10,000 times without a significant reduction in capacitance. This could translate into charging your phone in 30 seconds, or your electric car in a few minutes. 3. Wireless Power – Battelle’s February 2013 patent on using graphene to develop a more efficient Tesla Coil, where the graphene would wrap around the wires of the coil to act as protection against unwanted eddy currents, makes these coils far more suitable for wireless power transmission. Nikola Tesla’s dream of wireless power is still alive and well, living inside the power of graphene. 4. Super Sensitive Touch Screen – Samsung’s March 2014 patent describes using graphene to give all touch screens the ability to differentiate between weak and strong touch. 5. Ultra Thin Batteries – Apple’s June 2013 thin battery patent is focused on using graphene as a heat sink in batteries. In order to adequately cool a battery, a graphite coating is normally 30 millimeters thick. The graphene heat sink drops it to less than one. 6. Controlling Epileptic Seizures – Neurologists at the University of Washington have determined that cooling the brain by 1.2 degrees Celsius will inhibit epileptic seizures. Cooling is achieved by replacing a small piece of the thermally insulating human skull with thermally conductive graphene, allowing heat to flow from the brain to the cooler scalp. This technique has been demonstrated to prevent seizures before they occur. 7. Instant Deicing of Aircraft – In a February 2013 patent, Saab describes how to apply a graphene layer to aircraft wings to remove ice from the wings during cold weather, and eliminate the need for the ‘chemical spray’ used today. 8. Nano-Scale Transistors – A January 2013 patent by IBM explains how they’ve manage to mitigate many of the challenges of nano-scale electronics by removing the parasitic capacitance and resistance through a simple reengineering of the geometry of the transistor with graphene. 9. Thermo-Conductive Lubricants – A November 2012 patent by Angstron Materials describes dispersing single-layer nano graphene platelets in oil to provide improved thermal conductivity and reduce friction. In addition, it offers viscosity stabilization, and thermal conductivity values are the highest ever recorded for fluid materials. 10. Highly Efficient Water Filtration and Desalinization – Water and graphene have an unusual relationship. Water can pass through it, but almost nothing else can. Aluminum-oxide, currently used in many water filtration applications, becomes instantly outdated by graphene’s strength and rigidity. Researchers at Lockheed claim a graphene filter will reduce energy costs of reverse osmosis desalination by 99%. Spider silk is made from a biopolymer called an aquamelt, which can be spun at room temperature 1,000 times more efficiently than plastics. While spider silk itself will probably never be used, researchers are looking to make other materials that mimic spider silk’s tricks. One example has it being used to create bulletproof skin that instantly transforms the body into “cloaking mode” where wearers suddenly go invisible whenever signs of trouble appear.